When my artist friends are deliberating about becoming mothers, I don’t say, “Oh, just go for it–it will be fine.” I know this dilemma well. It took me five years to make my decision–to choose motherhood–and I wasn’t even doing creative work before I became a mother. The decision to begin writing and travel down a creative path came out of the kind of moment I’ve often had since becoming a parent: I wouldn’t take this risk for myself, I would just settle for something here. But I will take this risk for my girls, because I want them to know anything is possible. I want to show them how to find and follow dreams. Now my creative work and my mothering are intertwined like a double helix. There are greater demands on me as a parent than there were before–physically and mentally. I have so much less solitude and silence, and that has chafed at times. I find ways to build-in solitude, for my mental health as much as for my work. When my husband worked in an office, this meant that I left every Thursday night to go to the Chocolate Room. 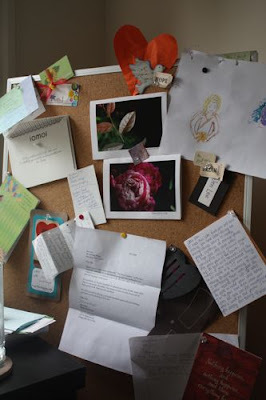 I could write, or read, or just stare at the wall–whatever I needed. Best of all, I could watch the humanity all around me without distractions and interruptions. Sundays were my day off. Still, I take Sundays to go on artist dates, go to yoga class, eat a meal alone, and then when I come home at dinner, I’m happy to see my children and ready to dive into another week. Lots more in this post — read it here. You’ll definitely want to add WishStudio to your regular blog reading list. now, with the boys out of town for a month, i have a lot more quiet, but i am floating in the ether rather than really creating anything productive. granted, c is still all toddler all over me all day, but, i don’t know. i miss them, i miss the challenge of writing with all the noise of boys fighting real and pretend battles, all the ‘mom-mom-moms, all the catch as catch can moments when something they are doing lights me up with inspiration. Then for a moment, I’m admiring the many hours they have available and the freeness of their lives. However… I’m proud I’m juggling and barely managing. Each child has their own dynamics in the household, combined with the daily life challenges makes for an amazing chapter at this point of my life. I wonder if I’m accomplishing more due to the children…I think I’ve just become more brave somehow. This might sound odd, but have you ever visit an elderly care facility? These people had lives that were once too filled with their young children. We have the best moments right now, we are free to do as we wish and being very fulfilling too. O.K My real issue …Sometimes I need someone to come up with “SuperHuman Energy” suppliment.